The Antenna Stabilization Unit (ASU) is meant for positioning and stabilizing the payload. The payload consists of RF front end and antenna. In order to maintain the Line of Sight (LOS) of the antenna towards the target, it is necessary to steer the antenna to the required angular position both Azimuth and Elevation against aircraft Yaw and Roll and the developed ASU performs this task. It consists of an Antenna, Antenna Control Unit, and a host Computer. 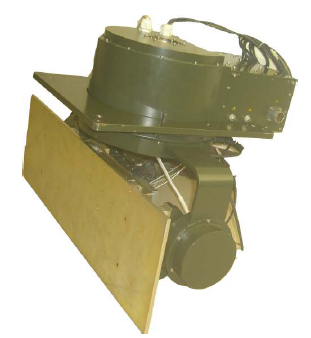 The ASU is TMS based DSP system capable of performing closed loop position control, motor control and monitoring functions and should point the antenna towards the designated area of interest using on-board INS data. The host computer issues mode selection command along with the relevant command data to the ACU. Payload Details Disc Antenna 700x215x10 mm, Weight – 6 Kg. Protection EMI/EMC, Will Conform to MIL-STD 461E. Thermal Shocks To withstand – 40° C to + 70° C as a sudden change.